A few weeks ago we took a look at the Disney-MGM Studios Theme Park News, the publication filled with news items pertaining to the third gate that was preparing to open in Florida. Today we take another look at the publication and its article on the times and places where you could find yourself during a typical day visiting the park. A few weeks ago we took a look at the Disney-MGM Studios Theme Park News, the publication filled with news items pertaining to the third gate that was preparing to open in Florida. Today we take another look at the publication and its article on the times and places where you could find yourself during a typical day visiting the park. 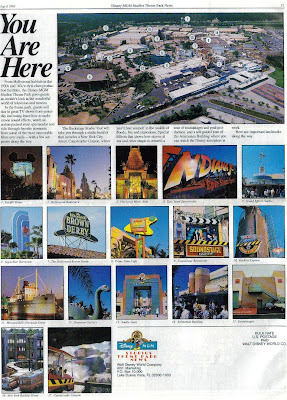 While many of these landmarks and vistas can still be experienced inside of Disney’s Hollywood Studios, some of these iconic images (such as the Soundstage Restaurant, The Monster Sound Show, the original New York Street, and SuperStar Television) are not lost to the Hollywood that was. One thing from Disney's Hollywood Studios I hope never disappears - Backlot Express. I know that isn't really related to anything, but it brings back many family memories!